Hey there! A friend of ours alerted us to a large pile of wood he was just going to throw out behind one of the buildings he owns and told us to help ourselves.......so we did. Can you believe that within that pile were these rustic solid 3 inch thick barn beams? I sure couldn't believe it and they were there for the taking......free. These suckers are heavy and thick and wide. Perfect for something special I have in mind. Amongst them was this very large beam between 4 and 5 inches thick. Still trying to decide what to do with that one. I'm working on my own version using these photos as inspiration. 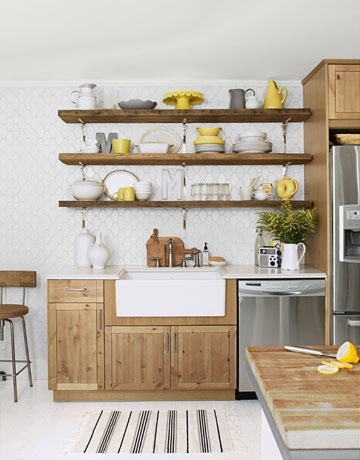 I happen to love open shelving in the kitchen and have always wanted it. I don't get to hung up on worrying about how impractical it is or isn't because I have the lower cabinets, as well as cabinets on the other side of the room, to hide all the ugly plastic dishes that I don't want showing. So, with some of our other projects on hold, this is what I hope to be working on this weekend. I'm hyperventilating! That is exactly what I want to do in my own kitchen. I love open concept shelving--which is good because my kitchen/dining room/living room is one big room! I love the splashes of yellow in the photo above. Thank you for sharing your inspiration! This is a beautiful idea! I love open shelving too. I have so many white dishes that don't have to be organized or even the same pattern or style to look good together. You have some great friends! I love all those inspiration pics and knowing you like I do, I have no doubt yours will look just as good (if not better) than those photos. Get to working girl...your peeps await the reveal! I adore this! I'm trying to get a more rustic and earthy feel to my dining room. This may be just the ticket! I can't wait to see how it turns out! I'm jealous I don't have a friend getting rid of fantastic barn would like that! You always have the best ideas and the best stories of how you find your goods!! I love it. :). Happy Thursday, sweet friend. Oh my goodness!!! SO JEALOUS, Diana! Lol. Can't wait to see the finished shelves! Now that's a good friend! What beautiful boards...I can't wait to see what you do with them! what a sweet score for the whole lot especially that really thick one. 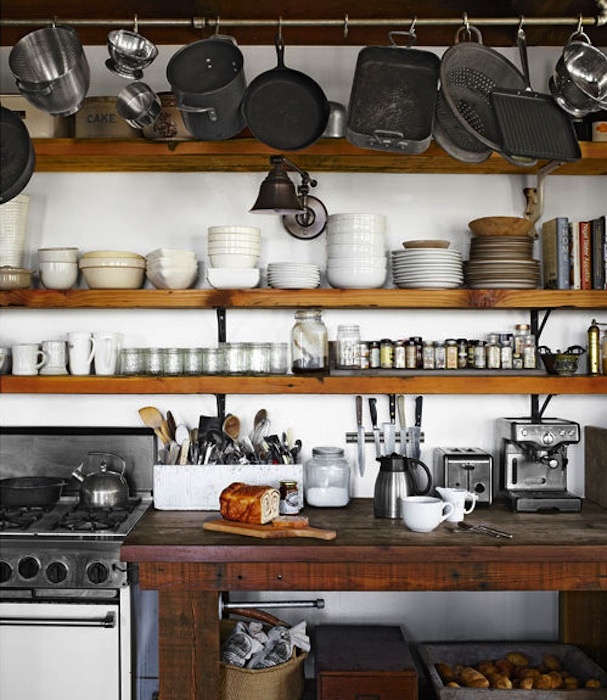 I love open shelving too, but my husband would never go for it. Looking forward to see how you decide to do your shelving. Love, love, love your inspiration photos. You always get inspired with great photos, but make your project your own. I love that! These are just brilliant. Great work, keep it up! Can't wait to see your other creations. What a find! They will look perfect as open shelving. I can't wait to see what you do with them. 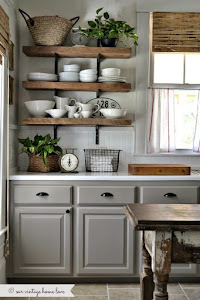 Excellent conversion, I am amazed that how beautiful you have converted simple wood into kitchen shelf and cabinets. I really love it. Yes, the picture shown is incredible. Apparently the wood as it produces a very beautiful furniture. Wood look old and rustic. Your idea is good to use them but it is very difficult work and you will need some professional to do this work.